Impress Blinds brings you a wide collection of quality and cheap window blinds to dress your home or office windows. From vertical blinds to vision, Metal Venetian, conservatory blinds, roller blinds, Vellux and Roman blinds, we supply and install all types of window blinds in Mansfield and all over the UK. Our made to measure blinds can easily fit to any window type while complementing your home decor. Ranging from soft neutral accent to bright colors, you can choose from a huge range of colors, patterns, fabric and textures. If you have a unique designer style in your mind, then talk to us, our designers will craft a beautiful custom made to measure blinds that you’re searching for. Our high quality window blinds are durable and stylish and perfectly blend into any project including bathroom, kitchen and conservatory. We provide best window treatments and supply widow blinds to both residential and commercial clients in Mansfield and surrounding areas and across UK. From measuring to delivery and fitting, our dedicated and efficient team is committed to providing you exceptional quality products and services. Impress Blinds Know how to make its clients happy so we offer quality window blinds at discounted prices. We offer 3 roller blinds just for £119 and 3 vertical blinds for £79. Each blind comes with the 12 months guarantee. Moreover, we also offer free of cost measuring and fitting services to our clients in Stock on Trent and all over the UK. Having a strong presence in Mansfield, our partners and advisors are available here to serve you with the best possible window treatment in Mansfield and surrounding areas. So we assure you a fastest local service with an appointment time that suits you best. 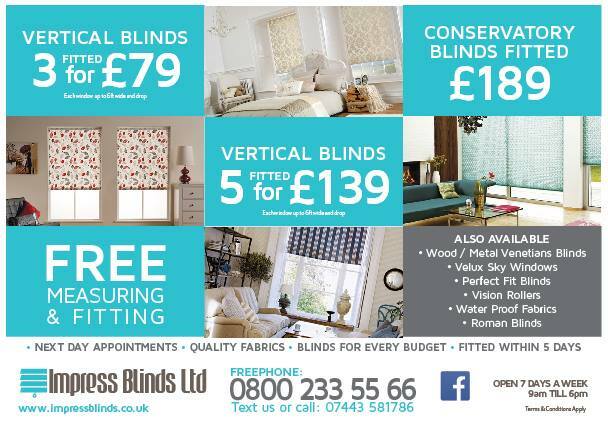 We Impress Blinds always deals with quality and reliable services. That is why we have made our clients satisfied not only in Mansfield but all over UK.